Published on April 23, 2015 in General Interest. 0 Comments Tags: Warehouse Layout, Warehouse Planning, Warehouse Specialists. Productivity in the workplace isn’t something that happens by accident. The most successful business owners will tell you it comes down to the team, a system of procedures and the physical organisation of your operation. 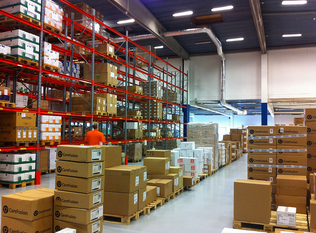 So if you’re looking to make your warehouse more productive here are three top tips. Regardless of whether you run a warehouse, an office or a shopfront, business thrives on systems and procedures. Noting down what you expect to happen, when, how and who in the organisation performs that task is the most effective way of communicating with your team about the goals and operations of your company. Written systems and procedures also allow your team to know who answers to whom and how your company is expected to operate on a day-to-day basis and especially when things don’t go to plan. It also allows you to ascertain whether your business is meeting its expectations and key performance indicators, how your time and money are being spent, or whether there are areas in your company that need an overhaul or re-assessment. A systems and procedure document also allows you to operate with the minimum staff required in a time-efficient manner, knowing that every person has a clear job for which they are responsible. Clear communication amongst your staff and management is also a sign of a business with the intention to succeed. It allows the manager and owner to let their people know their expectations and goals, but also ensures the most junior of employees have the opportunity to voice concerns or thoughts about the operation of the business. Good two-way communication has been shown to cut down on injuries, workplace bullying, and business inefficiencies. Time, money and effort are all wasted through poor organisation. From mapping out your organisational structure along with systems and processes to the physical organisation of your warehouse, your plan should be to optimise efficiency. That includes optimising the efficiency of your space and stock layout. Good organisation, stock tracking and itemisation means your staff can access products when and where they are required in a time-effective manner. That may mean keeping your most used stock items in easily accessible areas or reworking your space and storage solutions to ensure all stock is readily accessible. Good positioning of your stock, clear itemisation and easy access to all stock also ensures the safety of your workforce. Reputable storage solution companies such as Elbowroom have some great alternatives when it comes to re-organising the physical space of your warehouse and their products range from document storage boxes and benches right through to pallet racking (click here for more details). Being organised has many benefits – productivity is one! In the end productivity is about the bottom line. It’s about finding efficiencies and using them to your advantage by working with your team, communicating effectively and using your space to its best potential. Published on April 3, 2015 in General Interest. 0 Comments Tags: Fashion, Fashion Business. As something that a fashion minded-person may do in their life, it makes sense that you do all the necessary research before you get started on the path of becoming a small business owner in the highly competitive world of fashion. Let’s take a look at these handy tips to get you on your way to success. Fashion is an amazing world of exciting and interesting people, so these tips will help you to get on your way when it comes to making some serious waves in the world! Be practical about what you need to work towards and why you are beginning your business in the first place. It is pretty damn easy to be blinded by an alluring industry, loaded with travel, designs and clothes, amazing occasions and parties, and really lovely people. Sadly, the truth is never as realistic as the reality! The best part of your time with be spent overseeing stock, overseeing employees, attempting to find ways to cut costs, making deals and promoting your brand while at the same time facilitating suppliers and clients the world over who are often working in diverse time zones and need replies 24 hours a day. All this you have to do while attempting to eat, sleep, shower and find some common ground to live on! Outsourcing helps you to concentrate on the things that you appreciate, as well as do well. It is ideal to have the time and ability to concentrate on what you can do, and then find a specialist to help you look after everything else you’re terrible at. Look into your contacts list, probably there is someone there who either has the talents and skills you are searching for, or knows somebody who does. You need a name that is anything but difficult to remember, and generally simple to spell. Owning a space isn’t super duper expensive, so consider buying both the .com.au and .com renditions of your site, or even substitute spellings, to catch clients who have incorrectly spelled it unintentionally. At the point when there are endless amounts of online retailers, what will make your client buy with you, and come back to you over and over? If there is a genuine hole in the Australian market for a certain type of fashion you should utilise it! Your stock needs to get to your client one way or another! Figure out what is important to your client and then listen and react to input. Many clients love 24 hour shipping, so listen to them and make it happen to keep them happy. If your system isn’t that great, think about using dark fibre for your intranet or online communication. No matter what, listen to the client, react quickly and appropriately, keep them educated and be super proactive in serving to place or replace their order. A great website is essential but just be aware that it can come at a bit of cost to get a great and responsive website. You might need a designer, a marketing expert and also someone to build the site, depending on your template. Make the site and the style of the site really speak to your clientele, and after that make it simple for your client to buy by looking at their experience. You would prefer not to lose clients on the grounds that you have overcomplicated the experience!